SINGAPORE is known for its stunning architecture, its botanic gardens, its vibrant ethnic centres, green spaces, myriad activities, and above all food - from high end restaurants to bustling hawker markets. Now, in its ever-evolving exciting narrative, Singapore will become known for its art. Curating an unparallelled collection of modern art from the Asian region, the new National Gallery Singapore joins a line-up of art galleries and museums, painting Singapore as a blossoming global city of the arts. National Gallery Singapore, which opened on November 24, offers more than 8000 of the region's most extraordinary art pieces from the 19th and 20th centuries. 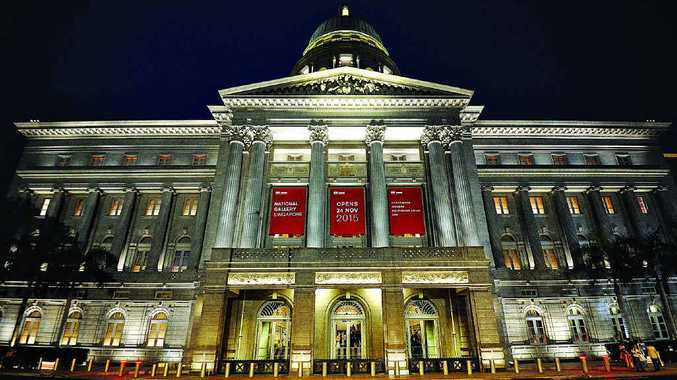 Housed within the restored, historical gems of the former Supreme Court and City Hall, National Gallery Singapore offers the world's first and largest insight into South-East Asia's culture and history. The gallery is a great starting point to follow the pulse of the arts scene and become immersed in Singapore's thriving cultural brew. Start by using the free museum shuttle which operates daily from 10.30am to 4.30pm between Singapore Art Museum, National Museum of Singapore and Singapore Pinacothèque de Paris. A must for contemporary art lovers, the Singapore Art Museum (SAM) offers an invaluable collection of South-East Asian contemporary art alongside a growing contribution from international artists and galleries. SAM's vision is to "breathe art into life" and provide a range of contemporary art that inspires visitors to think, feel, experience and imagine. Visitors can lose themselves in the Think&Tinker Room, an interactive space for all ages that allows everyone to embrace creativity and rethink how they play their favourite game or watch their favourite movie. A recent newcomer to Singapore's arts scene is the Pinacotheque De Paris, where the Singapore iteration is the first expansion beyond this renowned museum's flagship gallery in Paris. Besides marvelling at the extent some collectors will go to for their passion, change the way you view art by witnessing connections across centuries, continents and styles of art at the Cabinet of Curiosities exhibition. Think that there's no link between Picasso, Monet, and Rembrandt, and tribal art in South-East Asia? Think again. The Gillman Barracks is the cultural hub for 11 international art galleries, three restaurants and the NTU Centre for Contemporary Art Singapore. The galleries, housed within conserved colonial barracks built prior to the Second World War, offer dynamic contemporary exhibitions from an array of national and international artists, both established and emerging. Wessex Estate in Singapore has become an artist enclave, with local and international artists setting up studios. Since 2006, artists have been uniting once or twice a year for a weekend-long Art Walk, welcoming the public into their studios to meet the artists and view their works.